Tana is an environmental technology company and the forerunner in providing solutions for the field of solid waste management. Our main objective is to develop intelligent machines and services to meet and exceed our customers’ expectations. 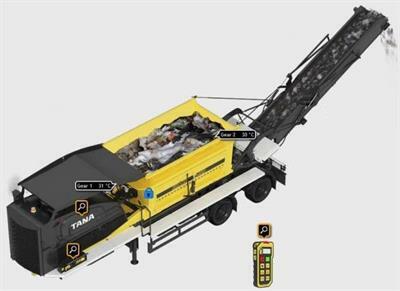 Tana currently offers solutions in landfill operations in form of the E Series landfill compactor, in recycling processes with Shark slow-speed shredder and in mobile material screening with 6D smart drum screen and the TE mobile disc screen. Tana's mission is to provide customers with simply more money on the bottomline with cutting edge technology in solid waste management combined with state-of-the-art control and monitoring systems. The objective of this mission is to improve our customers' business and enable them to increase revenue - from waste to value. Tana is a privately owned company, where long term targets are set, and we always operate with our customers in mind. Key principles in Tana's operation are reliability, customer orientation, responsiveness and continuous improvement. Having competed for market share with large multinational corporations, Tana has been able to differentiate itself and to win its customers' trust by relying on these core values. The fact that we are now leaders for landfill compactors in many markets is strong evidence of our success. We are aiming at the same objective with shredders, namely keeping growth steady and profitable. With our current management, Tana has increased sales year on year and tripled turnover in the last decade. Tana has always based and will continue to base its technology and service development on customer feedback combined with a high level of engineering experience. All products are purpose- built and unique in their field, and are designed to be simple, robust, cost effective and reliable. Tana is a leading player in the field of electric control system development which allows customers to use their fleet of Tana machinery to a level that has never been experienced in the sphere of mobile machinery business before. TANA ProTrack® improves machinery performance, allows tailor made programming for individual customer needs and expands customer process information through the internet which is available to operators, owners, service personnel - any party that is required to monitor and improve their business. Global presence is a must. Tana products are distributed in more than 70 countries in five different continents. This has encouraged us to be very innovative in setting up the service and back-up for our distributors and customers - always keeping in mind that the downtime of every single unit delivered should be at a minimum, regardless of its location. We are there to serve you. The company slogan From Waste to Value is a symbol of Tana's devotion to not only produce machinery that is unique in terms of its design and features, but also to provide our customers with solutions and services for improved productivity. Our mission is to improve our customers' businesses and enable them to increase their revenue - from waste to value. Tana's history goes back to the early seventies when a young entrepreneur and inventor had come up with a sort of a landfill compactor built around an ordinary tractor and equipped with rubber-wheels. The first real landfill compactor with two full-width iron drums was manufactured for an exhibition in Hanover, Germany, in 1971. The unit was sold and delivered to a German customer and so Tana's first step towards becoming a global waste management business was taken. 1971 is considered to be the year of birth of the company. The landfill compactor was continuously developed. New series kept coming, one after another: T Series, C Series, F Series. The picture above shows a TANA 27C with its proud owners in Spain in the late eighties. Over the years the company name was changed from Tana-Jyrä Ltd. to Kone-Jyrä Ltd. and finally to Oy Tanacorp Ltd. In 1995, the present owner of the company became involved in the business. That was the start of a complete turnaround in the company and the principle of continuous improvement was adopted. All products except for landfill compactors were given up, the organization and operations of the business were streamlined, new markets were entered into and customer experiences and feedback was gathered and carefully listened to in order to create even better landfill compactors. Product development was carried out in close cooperation with Norwegian customers, the distributor Magne Gitmark & Co. A/S, with whom we still co-operate with today. Eventually, the TANA G Series was born. The business grew steadily the following year, experiencing an annual 15-30% increase in sales volume and profitability. In 2003 the company, which was named Tana Oy at the time, decided to take another leap forward. Market demands, especially in the EU area, were changing. Instead of just disposing waste in landfills, the recycling and reuse of waste materials and converting waste to energy were creating new business opportunities. Tana Oy did not want to miss out on these opportunities and started by developing a slow speed shredder. The first industrial Series S5430 and S6330 was launched to the European market in early 2006. The initial phase went better than expected even though we faced the inevitable challenges whenever new machinery is introduced. In 2008 the new generation of slow speed shredders was launched, including two basic models (220 and 440), with a variety of platforms and with the option of being powered by a diesel engine or electric motor. Despite the excitement of launching a new product, landfill compactors continued to be Tana's main product. The G Series underwent a facelift into Gx Series and new markets in Africa, Eastern Europe and Latin America were entered into. Operations were streamlined once again, so as to ensure optimum service, security and quality for our customers all over the world. Today Tana is prepared for the future better than ever before. The E Series landfill compactor range was introduced in 2012. The appearance of the machine on very contemperary and the performance of the modularly structured machine combined with highly innovative machine-intelligence makes the machine stand out from its competitors. TANA Shark waste shredders are now available in a third generation outcome and they are gaining foothold wherever versatile and reliable shredding machinery is required. Tana 6D smart drum screens bring machine intelligence into the screening process with TANA ProTrack®. The 6D smart drum screen is designed to optimize your process, lower your running costs and maximize uptime. Tana has successfully operated and won market share in an industry where the most significant competitors are huge, multinational corporations which are tens, even hundreds of times the size of Tana. Unique, reliable, high quality products are part of the reason for this, but above all the respect that we show towards our customers, not only in sales and product support but also in our research and development work, contributes to our success. Moreover, our carefully selected distributor network around the world ensures that we can maintain market share despite our small size. Tana Oy has recognized the environmental influence during the lifespan of its highly innovative environmental techonlogy products. We emphasize highly on minimizing the harmful environmental effects of our products both when it comes to the production process as well as the life time at the end user's. Tana focuses on the environmental friendliness of the products, their recyclability and the economical savings caused by these in designing, producing, distributing and operating Tana machinery. Tana Oy operates in accordance with several quality and environmental standards and has complied to these. In addition Tana has its own tailor-made environmental policy and programme. 2. There are two different types of pressures at compaction: waste compacting and waste escaping pressure. Compaction teeth are pressing the material deeper and the pan around the drum/wheel is causing ground pressure (together with the teeth). Ground pressure only compacts the top surface as the teeth compacts the waste deeper. Finally the machine weight distributed on all these teeth will cause the whole drum or wheel to sink in to the waste and cause compaction. The more teeth are in contact with the waste the better. 3. Drum or wheel diameter: Big diameter of the drum means covering a larger area of the top surface which causes the machine to float on top of the waste. As the pan area only causes high top surface compaction, the four-wheeler needs to create a lot smaller compaction layer to achieve the same compaction level as the Tana full-width drum. 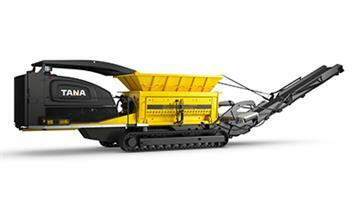 Smaller Tana compaction wheel diameter maximizes the machine ground pressure and maximized sinking of the machine. Sinking will cause the material to compact! Tana has conducted studies about the right compaction drum diameter over the past 40 years and found the right size to perform compaction on elastic materials such as MSW, plastics, mixed waste, etc. NOTICE: Tana compacts thicker layers because of the high number of teeth. 4. Drum or wheel width: Being elastic the waste wants to escape to all possible directions while it is being compacted. Too small width of the wheel will allow an extrusion at both ends and between the wheels. This will result in the already compacted area to become again non-compacted. Tana drum design is developed in a way that it will gain compaction with one pass and extrusion will happen only at both ends of drum. With Tana you may next time overlap this extrusion area to achieve a nice 100% compacted surface and prevent any extrusion of the waste. 5. The incoming waste type also has an effect on the final kg/m3. In some countries like Northern and Western Europe the waste is typically pretreated; e.g. the amount of organic material is minimized. In others like USA and Australia or some Asian countries the amount of organic waste can be extremely high. This obviously will have effect on what kind of compaction rate can be achieved. In any case TANA guarantees a minimum of 10 % better compaction rate. 6. The amount of incoming waste. If we simplify a lot it is possible to compact waste with any machine as long as the time spent does not matter. But because turnaround time is important and the incoming waste flow is constant it is necessary to achieve the highest compaction rate as quickly as possible with as few passes and low costs as possible. The weight of the machine in relation to the amount of waste, number of crushing teeth and the drum design are significant factors affecting this. The bigger the amount of incoming waste the better results Tana will achieve against any four-wheeled machine. Tana can compact a thicker layer and achieve a minimum of 10 % higher compaction rate faster than others.